By the age of eighteen her parents had found Sophia a husband who was convenient to them, John Musters. John was rich, good looking, and not too much older than Sophia. Sadly Sophia had feelings for George Pitt who, as a younger son, was not a convenient marriage for the Heywoods. Sophia and John married in 1776. A child was born to the couple every year for the next four years. 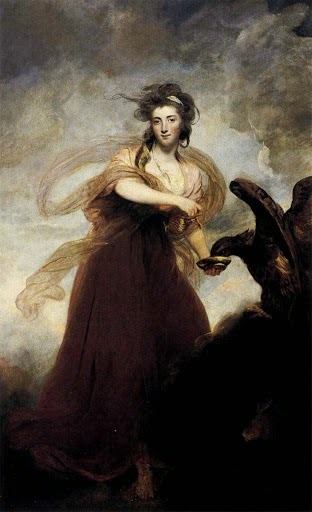 Fanny Burney described Sophia as “most beautiful, but most unhappy” as well as being the toast of the town. John was happy being a country gentleman but Sophia flourished in a metropolitan environment. She was adorable yet swore like Lady Lade. The men couldn’t stay away from the charming Mrs. Musters and who was she to deny them the attention? Once, at a ball, a man approached Sophia with a glass of chalk and water and used this clever pickup line: “Chalk is thought to be a cure for the heartburn; I wonder whether it will cure the heartache?”* No word on whether the line worked. It wasn’t long before Sophia threw caution to the wind and dove into numerous love affairs.